Once again the landscape of mobile SEO has webmasters and marketers scrambling to beat each other to the punch. Because of Google’s changes in algorithms and listings, what used to work is becoming more less effective and good cause for alarm. First of all, Google’s changed the way they list businesses and the like in their mobile results. Now those top spots can only be achieved through paid listings which unfortunately isn’t SEO at all and keeps the top listings far out of the reach of the regular business and SEO pro. What it’s turning into is not so much how well your site is laid out, but how much money you toss into the pot. This makes SEO campaigns cost prohibitive for the most part and calls for ingenious strategies on the other. 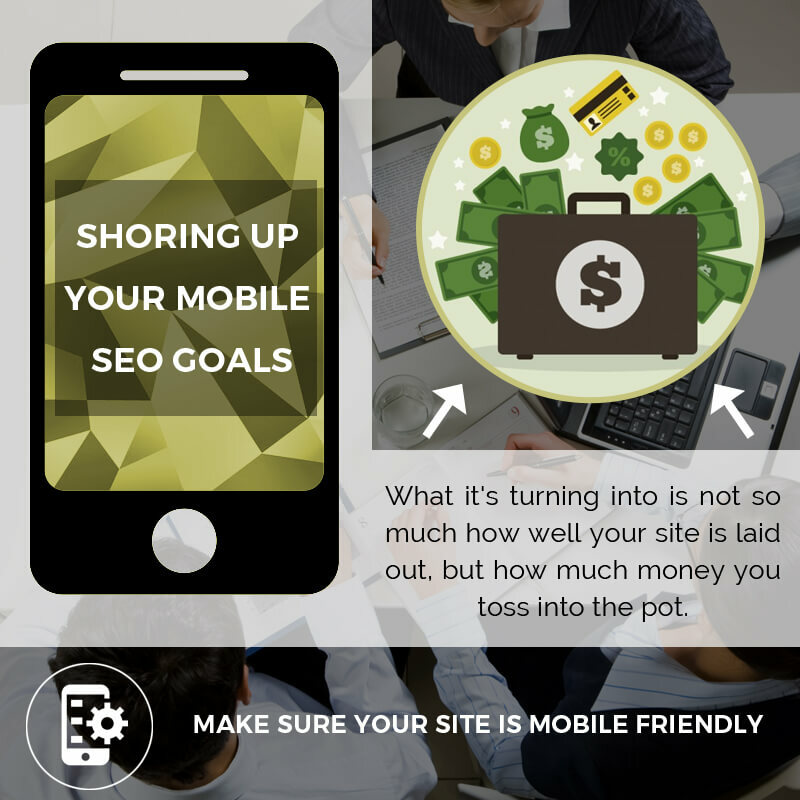 There are some basic things that one can do to shore up their mobile SEO campaigns. First of all, for what it’s worth, make sure your site is mobile friendly. To Google’s credit, they’ve supplied an awesome set of SEO tools for free. Using this basic knowledge, get your site up to mobile snuff and you’ll at least have a solid foundation to work from. Now comes the big game changer, correcting errors on your mobile site. Fixing these errors can make or break your overall efforts. It’s a battle between responsive design and dynamic serving. That’s what most believe, but in truth, it doesn’t matter if you haven’t corrected the errors on your site. Not fixing even the smallest of errors could cost you greatly in traffic and revenue and rankings. Doing this alone should shore up your SEO campaigns significantly and one should check all stats and metrics to see the difference. Next comes app store optimization. It’s literally SEO for app store search engines. This should be done first by making sure your app site is relevant with the right keywords, keyword phrases, and keyword groups. Don’t try keyword stuffing or you’ll get penalized. This is where mobile search words come in handy. Google is supposed to be releasing a mobile index this year which will allow for searches regarding what words and queries surfers are using. This tool is going to change the game significantly but you can do some work on your own by researching and applying what you know. Something to look out for is AMP aka Accelerated Mobile Pages. It’s still early in the game to see how important it is but it’s been increasing in visibility and it’s a good bet that it will be of significant importance by the end of the year. So the bottom line is these tactics and more are going to have to be re-examined by you and any changes made asap. The reason being is that the competition is horrific out there and getting more expensive. That’s why you need to some paid search in combination with your other tactics and techniques. This should balance things out over time so that you’re not overwhelmed if one thing takes supremacy over another. Don’t rest on your laurels either. There’s no telling what can sneak up on you and bite you in the hind parts if you’re not paying attention. Don’t underestimate your competitors either. Look at how their sites are set up and look for any errors as well. Look at their sites as you would your own. You will then see their strengths and weaknesses and be better at evaluating your own efforts. 2016 is going to be a major year for SEO due to the fact that the search engines are going to unleash new algorithms and software of higher intelligence and efficiency. They’re trying to cut down on criminals and unethical webmasters and marketers as they cost the legitimate industries and businesses and surfers immense amounts of money.